Where has cauliflower rice been all my life?! It is awesome and your mouth will totally feel like you are eating rice. You can eat it plain, raw or cooked, great filler to add to salads or soups and you can dress it up. 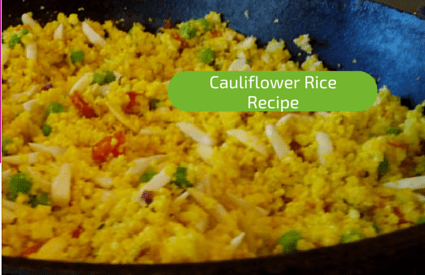 Here is a super easy cauliflower rice pilaf that I know you will love…and your hubby and kids won’t even realize they are eating veggies! Prep & cooking time: Less than 10 minutes! Working in batches, pulse cauliflower in food processor about 10 times until it resembles rice. Add onion and carrot and cook for a few minutes until onions are softened and carrots are still crisp. Walla – Another Easy Healthy Recipe that’s a great side dish! Here’s a tip. I rice up a head of cauliflower during my prep day so I have it available to whip up this recipe or eat raw, or with lemon or adding to salad. 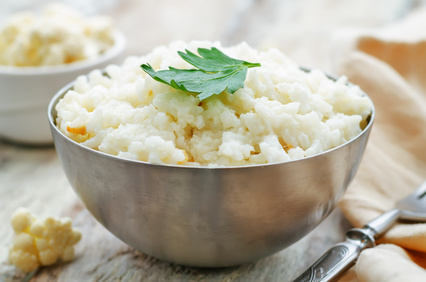 If you enjoyed this Cauliflower Rice Recipe, I would greatly appreciate it if you commented below and shared on Facebook & Twitter.